A New Haven resident, Mr. Daniel Anthony Clark, age 53, passed away Saturday, March 30, 2019 at his residence. He was born May 3, 1965 in Nelson County to John Francis “Jack” and Kathleen Lewis Clark. He was a former employee of T.G. Kentucky in Lebanon, was a top notch D.J. who was known as Dirty Dan, and was a member of St. Vincent de Paul Catholic Church. Dan loved UK basketball, riding horses, singing, and making people laugh. He was preceded in death by 2 brothers, John Francis “Frankie” Clark and Jerry Wayne Clark. He is survived by his daughter, Jasmine Clark, 2 sons, Shawn and Devin Clark, all of Bardstown, his parents, Jack and Kathleen Clark, his sister, Sabrina (Ralph) Douglas, all of New Haven, 2 brothers, Timothy “Bear” (Angie) Clark of New Haven, Ernie (Tracy) Clark of Boston, his sister-in-law, Toni Clark of New Haven, 3 grandchildren, Ally, Keatyn and Airalyn Clark, and the mother of his children, Ginny Clark of Bardstown. 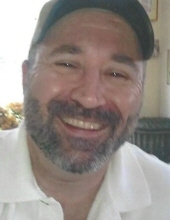 A Mass of Christian burial for Mr. Daniel Anthony Clark wil be 11:00am Wednesday, April 3, 2019 at St. Vincent de Paul Catholic Church in New Hope. Fr. Ken Fortener, celebrant. Interment will be in St. Vincent de Paul Church cemetery. Visitation will be Tuesday from 3:00-8:00 pm at the Houghlin-Greenwell Funeral Home, 1475 New Shepherdsville Road, Bardstown. A prayer service will be 4:30pm Tuesday at the funeral home. The family requests that expressions of sympathy take the form of contribution to the UofL James Graham Brown Cancer Center. The Houghlin-Greenwell Funeral Home is in charge of arrangements. To send flowers or a remembrance gift to the family of Daniel Anthony Clark, please visit our Tribute Store. A prayer service will be at 4:30 pm. "Email Address" would like to share the life celebration of Daniel Anthony Clark. Click on the "link" to go to share a favorite memory or leave a condolence message for the family.